Being a city guy, I rarely find my self in a situation to shoot a proper landscape photo. However, the other day I was out scouting some locations to shoot some photos of particular rural neighbourhood on the edge of the city limits. 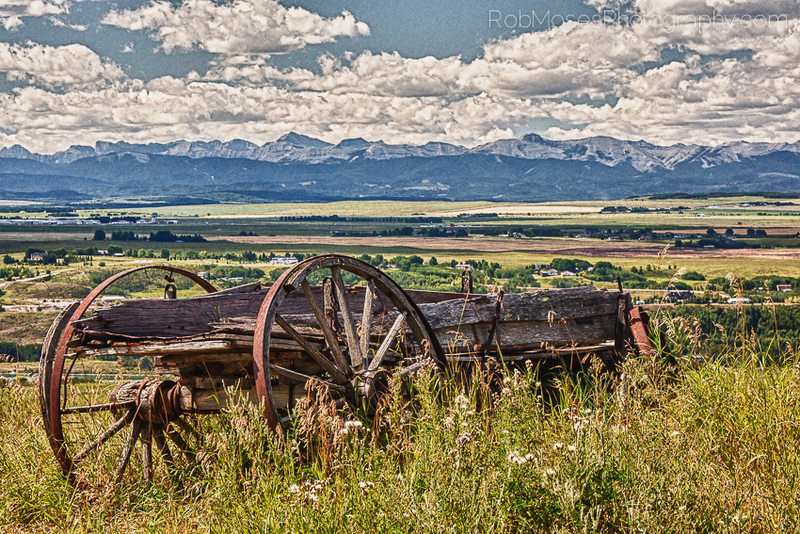 While on my scouting mission I noticed this old wagon sitting near the entry of a ranch. At first I thought I’d come back another time, but as I was leaving I realized the chance of me actually driving all the way back to that location again for a landscape photo was rather unlikely, so I went back and here you go ;). If you follow me on instagram you have probably seen something rather similar to this that I took on my phone. If you would like to see the picture I took with my phone it is here. This entry was posted in Random, Uncategorized and tagged 5D3, 5Diii, 70-300mm, Alberta, beautiful, Calgary, Canada, canadian, Canon, clouds, country, country side, DO, landscape, mountains, old school, Photography, ranch, rockies, rocky mountains, rual, scenic, sky, vintage, wagon, yyc, zoom. Bookmark the permalink. Love the Big Sky and the mountains. Well done! Beautiful. Could easily be a painting. Love that photo. It’s great when you find things to shoot that are rare and outside the box. A lot of times I find amazing things to shoot and I don’t have my camera. Thank you! Ya that’s the worst when you don’t have your camera haha. Cool shot. Where is it? Truly incredible ~ so well done!